With the news that there are two medical marijuana initiatives currently collecting signatures for inclusion on the Ohio ballot in November, I thought it might be a good idea to examine some of the science behind medical marijuana. This is certainly not a medical journal, and my goal is to make some of the scientific and legal aspects of medical marijuana as simple as I can — both for my benefit and the reader’s. None of this, of course, is medical advice — I’m not a doctor. Talk to your doctor about your specific treatment options. Unfortunately, there has not been much research done on medical marijuana, at least not at the level that would be appropriate for some other prescription drugs. This is fora few reasons: (1) it’s hard for researchers to procure the amount of marijuana they need to conduct this research, given the plant’s legal status; (2) it’s hard for researchers to get the funding they need to complete the studies; (3) it’s hard to find a plant with the consistent chemical makeup; and (4) patient responses regarding pain alleviation may be clouded by the euphoria, or “high,” that may result from using medical marijuana. However, there are certain things that we do know. To start, the main reason for using marijuana as medicine is its cannabinoids — the group of chemicals that causes the physiological effects when a person uses the drug. These cannabinoids can also be found in other animals or plants or made synthetically. The one that has everybody talking is known as THC (tetrahydrocannabinol), since it is the most psychoactive of the bunch. THC is responsible for the resulting “high” after marijuana use. There are other active cannabinoids, though, that have different effects. Some are responsible for suppressing a person’s immune system (known as immunosuppressive cannabinoids). Suppressing an immune system sounds dangerous, but in some circumstances it can be beneficial. For example, patients with multiple sclerosis have an immune system that attacks their own bodies. For those patients, a suppressed immune system may be just what the doctor ordered. Medical marijuana can also be used to combat some of the nausea and vomiting associated with chemotherapy, as was recognized by the Institute of Medicine. In fact, there are some drugs on the market now that make use of the anti-nausea cannabinoids, like Marinol, Cesamet, Zofran, and Emend. These drugs can combat the nausea and vomiting without producing the high associated with marijuana use. Unfortunately, no tests exist that compare the effectiveness of marijuana to the modern anti-nausea drugs like Zofran and Emend. The fact that the modern drugs don’t have the psychoactive effects of marijuana is beneficial when a physician is only trying to treat nausea or vomiting, but we all know those aren’t the only symptoms associated with cancer or chemotherapy. In fact, having cancer can cause a person to experience great anxiety or dread — normally treated by anti-anxiety benzodiazepines like Xanax or Valium. However, the euphoric high experienced when using marijuana can therapeutic in that it helps to relieve that same anxiety or dread. Many patients might prefer using one drug (marijuana) to treat multiple symptoms, rather than being prescribed multiple drugs to treat multiple symptoms. After treatment has ended, a patient may become dependent on the drug used to treat his or her symptoms. That patient is likely to experience more severe withdrawal symptoms after using benzodiazepines than would be the case if the patient was treated with marijuana. Withdrawal symptoms associated with marijuana-dependent individuals may last 1-3 weeks while withdrawal symptoms may last for months after stopping use of benzodiazepines. Marijuana is currently listed as a Schedule I drug under Ohio and federal law, meaning it has a high potential for abuse without any recognized medical benefit. I have not read any studies regarding the likelihood of dependency or abuse of marijuana compared with benzodiazepines. If you are aware of studies of that nature, I would certainly be interested in reading them or getting your take on the results. In my mind, the question is no longer whether marijuana has a medical benefit. Rather, researchers are attempting to determine the extent of those benefits. These are questions better answered by doctors, patients and scientists — not legislators or bureaucrats. I’d love to hear your comments on medical marijuana, so be sure to post them below. 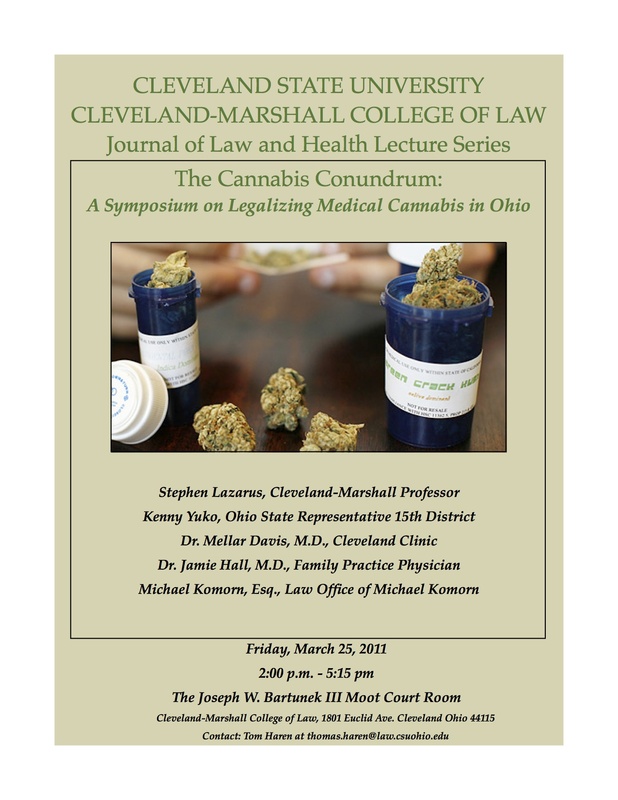 Below is video taken from a March 2011 symposium held at Cleveland-Marshall College of Law on the subject of legalizing medical cannabis in Ohio. The symposium featured Ohio State Representative Kenny Yuko, Cleveland-Marshall College of Law professor Stephen Lazarus, Cleveland Clinic physician Mellar Davis, Michigan physician Jamie Hall, and Michael Cohill, who was involved in drafting the Ohio Medical Cannabis Amendment ballot initiative for inclusion on the Ohio 2012 ballot. The participants discussed the implications of legalizing cannabis in Ohio, as well as the effects of Michigan’s Medical Marijuana Act and its impact in that state. Ohio 7th District State Representative Kenny Yuko introduced House Bill 478, which would legalize in Ohio the use, growth and dispensing of medical cannabis for persons suffering from debilitating conditions including cancer, glaucoma, multiple sclerosis and Crohn’s disease. House Bill 478 is not unlike other medical cannabis laws passed either through legislation or by referendum around the country. Medical cannabis is legal in Michigan, which provides an intriguing opportunity to see how medical cannabis legislation works in the Midwest. 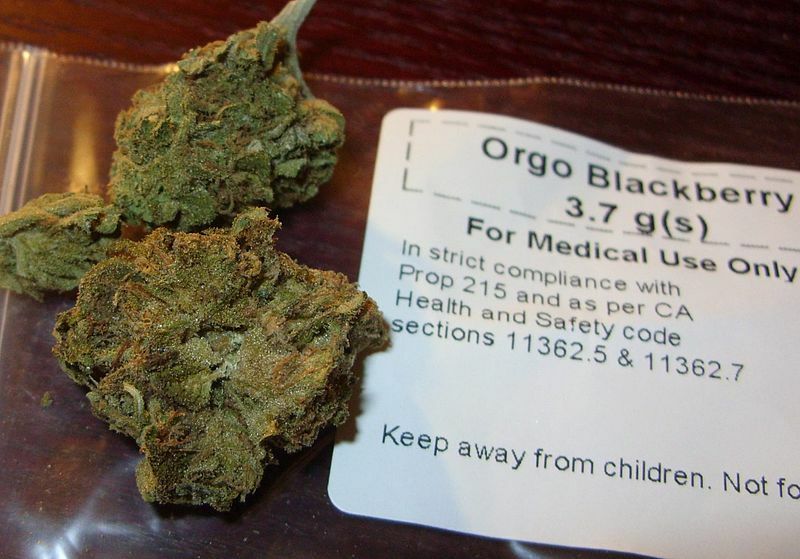 Medical Cannabis on the 2012 Ohio Ballot? Given the incessant coverage of the 2012 Presidential primary contest (can you believe Mitt Romney’s tax rate?! ), it’s no wonder that many Ohioans aren’t aware that medical cannabis could be on the November 2012 ballot in Ohio. That’s right. In November, Buckeyes across the state may get the chance to legalize medical marijuana. There are two ballot initiatives out there currently: (1) the Ohio Alternative Treatment Amendment, and (2) The Ohio Medical Cannabis Amendment. Both ballot initiatives have obtained the required approval from state authorities to begin gathering signatures. The amendments need 385,245 valid signatures of registered voters to qualify for the ballot. If either of these ballot initiatives pass, Ohio would become one of 16 states, plus the District of Columbia, to have some sort of legalized medical cannabis laws. The Ohio Alternative Treatment Amendment, proposed by the Ohio Patients Network would allow doctors to recommend medical cannabis to adult patients with a qualifying medical condition. Under this amendment, patients could possess up to 3.5 ounces of cannabis and cultivate up to 12 plants. Regulation of medical cannabis would fall largely under the auspice of the Ohio Department of Health, although local zoning authorities would play a role in determining where “safe access centers” (dispensaries) could locate. The Amendment also prohibits the centers from being located within 1000 feet of certain buildings, such as churches or schools. It would not be legal to operate a vehicle under the influence of cannabis, nor would employers be required to allow employees to use cannabis on at the workplace or allow employees to work while under the influence of cannabis. However, the employer would have to demonstrate that the employee was “impaired” if he or she claimed the employee was under the influence. Notably, no health insurer, including the state of Ohio, would be required to reimburse a medical cannabis patient for the costs associated with using or obtaining medical cannabis. The OATA is supported by the National Organization for Reform of Marijuana Laws (NORML). Click here for the full text of the amendment. Click here for a summary of the amendment. The Ohio Medical Cannabis Amendment takes a different approach than the OATA, mentioned above. Rather than prescribe a regulatory scheme like the OATA, the OMCA takes a “rights” approach to medical cannabis, including among an Ohioan’s rights the right to “be eligible to use cannabis as medicine as a result of a diagnosed debilitating medical condition.” The OMCA would establish the Ohio Commission of Cannabis Control to regulate, fairly exclusively, medical cannabis in Ohio. Because the OMCA would turn over the “nitty gritty” affairs of medical cannabis regulation to the new Ohio Commission of Cannabis Control, the amendment language does not provide much detail regarding exactly how medical cannabis would be regulated in Ohio. However, the OMCA does state that it does not authorize the operation of a motor vehicle when under the influence of cannabis, nor does it authorize the use of cannabis when doing so would constitute negligence or professional malpractice (limitations also present in the OATA). It will be interesting to see what happens with these amendments, whether either obtains the necessary amount of signatures to appear on the ballot, or whether either passes in November. In 2009, a University of Cincinnati poll found that 73% of Ohioans would support legalizing medical cannabis in Ohio.